As has now become tradition within the world of magic, as well as in the little world I live in, the last weekend in February saw the Blackpool Magicians’ Club holding their annual convention at the Winter Gardens in Blackpool. Officially recognised as the largest magic convention in the world with over 3,000 magicians from all over the world congregating in Britain’s favourite seaside resort at the end of winter for a weekend of fun and mischief, the Blackpool Convention is not so much a convention as a cattle market of magicians trying to either see or buy the same thing at the same time. From an “official events” standpoint (lectures, performances and such like), it wasn’t too bad – certainly better than some conventions I’ve been to. Socially, it was one of the best and one of the most fun weekends I’ve had for a long, long time. One of my main highlights was finally getting to meet a gentleman called Joe Porper, a person who encompasses the best of both of my worlds – magic and pool. Joe is well known in the pool world as a maker of top quality cue cases and high-end custom pool cues, as well as some brilliant accessories to help put a tip on your cue and make sure it performs correctly. He is also known in the magic world as the maker of top-quality props and accessories – his magic wands, which screw together like a pool cue, are some of the nicest I’ve seen. You can see Joe’s pool equipment at his Creative Inventions website and his magic stuff at his Porper Originals website. Another highlight was some of the Sunday night Gala Show. Now, I’m not normally a Gala Show fan, although I will watch them, but 3 of the acts on that show stood out far and above the rest of them. Tony Chapek had a brilliant act in which he interacted with a character on a TV screen (very, very funny). Men In Coats did a lot of stuff that I had seen them doing on TV and a lot that I hadn’t. Seeing them live was even better! Jerome Murat did a fantastic act about a statue. Fantastic stuff. Highlight of the Close Up and Lectures was Rick Merrill I had seen at the MacMillan Convention I was at in London last November (there’ a report about it on this blog) and he didn’t disappoint here either. I also went to see Martin Nash’s lecture, but it was a little disappointing as he was making a lot of mistakes mentioning that it had been 15 years since he had performed in front of magicians. Although it was great to see and meet him, it was a shame that he was very rusty and not on top form. I am sure, however, that his American lecture tour will shake that rust out of him and he’ll be back on top form in no time. Dealers were… the same! Pretty much the same people in the same places in the same halls. Almost like deja-vu – again! I did manage to buy the smallest set of brass Cups and Balls that I had seen in years – really dinky and pretty cool. As I said previously, the best part of the whole convention was the social aspect! Sitting around the Ruskin Hotel (the HQ hotel for the convention) having a laugh with friends. Sadly, and not for the first year, there were no real sessions as such. No groups of magicians sitting showing each other tricks or coming up with new tricks. But it was great fun seeing so many friends that I only get to see at the different conventions I go to. Because of this, even with what I said about Blackpool being a cattle market of conventions, it was with a heavy heart (and very heavy eyelids!) that I left at the end of the weekend. Will I be there next year? I don’t know. I would like to go to a big pool tournament in January, but I don’t think I’ll have enough holidays left to be able to do so. I’ll just have to wait and see, won’t I? I've got some pictures, which I'll post a link to once they're sorted out. Sunday 12 February, the day after my Mum’s party, saw the second of this year’s SAPPA Tour events, this one being held at Riley’s in Stirling – always one of my favourite clubs in Scotland. Another excellent day with several more SAPPA debutants making an appearance and giving the Scottish Tour a try. As last time, the format was Double Elimination until the last 16, with Single Elimination to find the winner. With the balls as they lie in the diagram above, I was obviously snookered on the one-ball (in 9 Ball, you have to hit the lowest numbered ball on the table and jumping the cue ball over an intervening ball is legal). I dug out my jump cue from my case and lined the shot up, intending to get the one-ball into the pocket at the bottom right corner of the picture. I hit the shot and the cue ball jumped over the 6 and hit the one-ball on its landing. This caused the one to jump into the air a little and landed on the corner of the side pocket. The one ball then jumped vertically into air and dropped straight into the side pocket! This caused the games around me to stop as we all laughed at one of the most amazing shots that any of us had seen. I promptly missed my next shot, which was straight on! Typical! Next match and my reward for beating Usman was to play number 4 ranked Clark Smith. In a very scrappy match, which at times looked like neither of us wanted to win a rack, Clark managed to get a few more good rolls of the balls than I did and came away a 6 – 3 winner. Over to the losers’ bracket I went, a place I am more than used to. I had Ian McLachlan in my next match. Things started OK, but at 2-1 up a couple of drunk eejit football and rugby fans started singing and shouting at the top of their lungs. This threw me totally and my concentration was out the window and heading down the road! Before I knew it, I was 4-2 down! By this time, the management of the club had kicked the a***holes concerned out of the club and I started to play once again, managing to bring it back to 4-4. 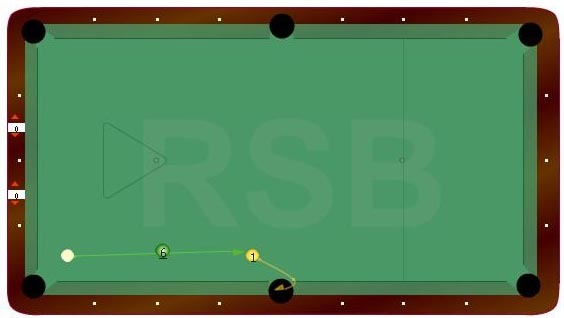 Sadly for me, things were not to go too well in the deciding rack as I made nothing on the break and when Ian came to the table, he started pocketing balls and managed to fluke the 9-ball to finish the match off. His comment of “the best player didn’t win” after the match was greatly appreciated. Ever tried organising a surprise party to be held in the house where the person who is being celebrated lives? It is far from easy! But that was the task facing my Dad, my Sister, Mhairi, and I on the run-up to our Mum’s birthday. Somehow, and I mean somehow, we managed to do it all without her knowing anything about it. There were a large number of clandestine operations happening on the run up to the party. It all started with Mhairi “suggesting” that she, her husband and their 2 sons come up for dinner on the Saturday night to celebrate Mum and Dad’s birthdays (which are within 3 days of one another). That was fine and everything was set in motion. Next was to quietly invite everyone that we were going to invite. The list of people came to around 18 people which, for our house, was just about right. On the day itself, I was “going to the pool room to get some practice.” Well, that’s what I had told Mum. In reality, I left the house with my cues in tow in time for the train at around 10:15am. When I arrived at the station, I met Aunt Moira who was there to take me to the Marks and Spencer food store and Asda at the shopping centre in Newton Mearns, Glasgow, so we could get the food supplies in for that night. The great thing about that shopping trip was that we had everything done in around an hour. The drawback was that we now had to sit tight and wait on a phone call or text message to tell us that Mum had left the house to go to Mhairi’s for the afternoon. Eventually – and I mean eventually! – the text arrived to tell us that it was safe to head for home. It was the longest hour-and-a-half that I’ve known for a while! With us back and the food in, we now had to wait until Mum returned with Mhairi, Callum, Lewis and Cameron so we could break the news to her about the party. They arrived around 5:30pm and it was left to me to tell her “Mum, you’ve got 2 hours to get ready – you’ve got a few folk coming round tonight.” After the initial look of shock and her verbal reaction – “you bandits, you bunch of bandits” – we started to get things up and running for the party. Before we knew it, people were arriving to have fun, eat, drink and get very merry. It was great to see so many people take the time to come to the party and, most importantly, enjoy themselves! Even my cousin Janice had timed a visit from her home in Kent to visit her own Mum so she could come to the party. It was great to see her again after far too long and Janice and I spent the majority of the evening standing in the kitchen where all good parties tend to happen) catching up. And yet, before we knew it, it was midnight and everyone had left to go home. Lewis and Cameron were upstairs in their beds, Mhairi and Callum and Mum and Dad went to theirs and I settled down on the living room floor, because Lewis was sound asleep in my bed (and I am not complaining!). It was great fun, but I wouldn’t want to go through it again for a long, long time! Photos will be online in due course, but I still need to sort them all out!